Background: There is an increasingly recognized association between pulmonary arteriovenous malformations (PAVM) and cerebral ischemia, frequently attributed to paradoxical embolization. PAVM occur in 20 to 30% of the hereditary hemorrhagic telangiectasia (HHT) population. Objective: To evaluate the risk determinants for cerebral ischemia and neurologic manifestations in patients with PAVM. Methods: A retrospective cross-sectional study was performed on consecutive patients admitted between 1988 and 1992 for treatment of PAVM. The number of PAVM, feeding artery (FA) diameters, and aneurysmal sizes were determined by pulmonary angiography. Patients were categorized as having single or multiple PAVM with an FA diameter of ≥3 mm. History, examination, and cerebral imaging studies were used to determine the prevalence of neurologic manifestations. Patients were defined as having cerebral paradoxical embolization if there was radiologic evidence of cortical infarction. Results: There were 75 cases: 26 single PAVM and 49 multiple PAVM. Cortical infarction was present in 14% of patients with single PAVM. Patients with multiple PAVM had a greater prevalence of any infarction (OR 3.2; 95% CI, 1.2 to 9.44, p = 0.030), cortical infarctions (OR 2.3; 95% CI, 0.58 to 9.2, p = 0.230), subcortical infarctions (OR 2.1; 95% CI, 0.58 to 7.95, p = 0.249), abscesses (OR 2.3; 95% CI, 0.46 to 11.94; p = 0.295), and seizures (OR 6.4, 95% CI 0.77 to 53.2, p = 0.054). Patients with multiple PAVM had markedly greater odds of having any clinical or radiologic evidence of cerebral ischemic involvement (OR 4.5; 95% CI, 1.47 to 14; p = 0.008). Conclusion: There is a strong association between single PAVM and various neurologic manifestations. The prevalence is greater for patients with multiple PAVM, suggesting increased predisposition for paradoxical embolization with a greater number of malformations. Paradoxical embolization occurs when emboli (thrombotic or bacterial) originating in the venous circulation bypass the normal filtering system of the pulmonary capillaries, enter the arterial circulation, and occlude arteries in various organs. Paradoxical embolization has become an increasingly recognized cause of stroke,1 particularly in younger patients without vascular risk factors.2 Abnormal venous–arterial channels that may increase the risk of paradoxical embolization include patent foramen ovale (PFO), congenital cardiac defects, patent ductus arteriosus, and pulmonary arteriovenous malformations (PAVM). Neurologic manifestations of HHT include migraines, cerebral vascular malformations (CVM), intracranial hemorrhages, cerebral abscesses, seizures, and cerebral ischemia.6-8⇓⇓ Paradoxical embolization is considered the likely predominant mechanism of cerebral ischemia in patients with PAVM.4,5⇓ Embolization of material originating from the PAVM has not been described, and polycythemia is uncommon owing to the frequency of hemorrhagic conditions. We performed a retrospective cross-sectional study on consecutive patients admitted to Yale–New Haven Hospital for endovascular PAVM occlusion from June 1988 to March 1992. Digital subtraction angiography was performed by selective injection of contrast material into each pulmonary artery according to standard techniques.10 Angiograms were reviewed independently by two interventional radiologists. Diameters of the PAVM feeding arteries (FA) were measured at the site of proposed occlusion, according to the methods described in a previous publication.10 The maximum diameter of the aneurysmal sac connecting the pulmonary artery to the pulmonary vein was also measured. All measurements were made by comparison with the reference diameter of the catheter and performing standard calculations to correct for magnification. When only one lung was injected, it was assumed that there was no PAVM in the contralateral lung if no abnormality was present on CXR or CT and if postocclusion arterial PaO2 levels were normal. Figure. 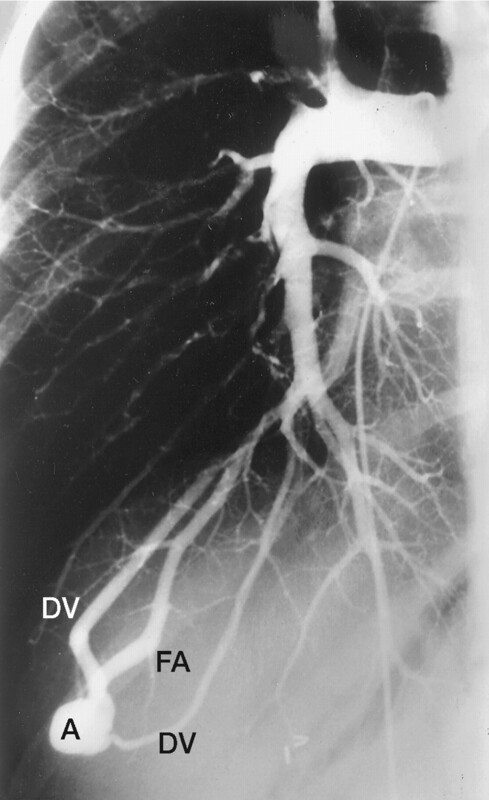 Pulmonary angiogram demonstrates a single arteriovenous malformation comprising an aneurysmal dilation (A), a feeding artery (FA), and two draining veins (DV). During hospitalization, patients were interviewed and examined by a neurologist. The interview focused on the potential neurologic complications of HHT, and all available medical records were used to supplement the patient history. All available cerebral imaging studies were reviewed. Patient history and medical records were used to determine the prevalence of migraines and seizures. History and cerebral imaging, MRI and CT, were used to determine the prevalence of abscesses and intracranial hemorrhages. The prevalence of CVM was based on history and MRI. Cerebral ischemic events were defined as clinical symptoms or deficits or imaging abnormalities due to ischemia at any location in the hemispheres or posterior fossa. All clinical events or radiologic lesions due to migraine, seizure, abscess, hemorrhage, or CVM were excluded from this analysis. Infarcts on imaging studies were categorized according to location as cortical or subcortical, as superficial cortical infarctions are most likely caused by emboli whereas deep subcortical infarctions are more commonly caused by local vasculopathy due to lipohyalinosis or microatheromatous disease of the small penetrating vessels.17 Cortical infarctions pertained to lesions in the cortex of the hemispheres or cerebellum as determined on MRI or CT, as their sensitivity is similar for detecting this pathology. Distinctive small subcortical infarcts in the hemispheres or posterior fossa were determined exclusively by MRI, given its greater sensitivity.18 Small subcortical infarcts were defined as being ≤1.5 cm in diameter and were distinguished from larger subcortical (striatocapsular) infarcts that are commonly embolic in etiology. Therefore, a cortical infarction on MRI or CT was considered the most sensitive indicator of cerebral embolization and was the primary endpoint used in determining the prevalence of paradoxical embolization. Clinical cerebral ischemic events were similarly divided into cortical and subcortical groups by a neurologist according to the presence or absence of cortical symptoms and deficits. Patients with accepted or possible risk factors for cerebral vascular disease (hypertension, diabetes, hypercholesterolemia, atrial fibrillation, coronary artery disease, mitral valve disease, tobacco use) were not excluded from analysis, but the risk factors were noted. For all outcomes analyzed, single PAVM was considered as lower risk and multiple PAVM as greater risk. The SAS (PC version 6.12) (SAS Data Corporation, Cary, NC) procedure PROC FREQ was used to determine OR, their 95% CI, and p values for comparing odds. OR were calculated using frequency values according to the following equation: OR = [(single PAVM without disease) × (multiple PAVM with disease)]/[(single PAVM with disease) × (multiple PAVM without disease)]. The 95% CI was listed for each OR. The p values associated with each OR presented were determined by the χ2 method if all four values were >5 or by Fisher’s exact test (two-tailed) if any of the four values was <5. Wilcoxon scores (rank sums) for FA diameters in infarct and noninfarct cases were determined by the SAS (PC version 6.12) (SAS Data Corporation, Cary, NC) procedure PROC NPAR1WAY with option WILCOXON and used to determine their distribution differences. Seventy-five patients had PAVM with an FA diameter of ≥3 mm. HHT was clinically present in 72 (96%) of patients. Baseline demographics and evaluations are detailed in table 1 . Twenty-six patients (35%) had a single PAVM and 49 (65%) had multiple PAVM. Two patients had a unilateral angiogram only, but they had a normal CXR of the contralateral lung and normal postocclusion PaO2. Patients with a single PAVM had a mean FA diameter of 6.6 mm and a median diameter of 5.2 mm (range 3 to 16.1 mm). The mean aneurysmal sac maximum diameter in this group was 30.4 mm and the median diameter was 25.5 mm (range 9.5 to 90.5 mm). One patient with single PAVM had no PAVM aneurysm but only a fistula. Five patients with single PAVM (19%) had one additional minor PAVM (<1 mm FA), and one patient (4%) had two minor PAVM. A complete neurologic evaluation was performed at our institution on 58 (77%) patients, and the remainder had an outside evaluation. The prevalence and type of neurologic manifestations are summarized in table 2 . The prevalence of abscesses and seizures in patients with multiple PAVM was at least twice that of patients with single PAVM, but the differences were not significant. Seizures in patients with multiple PAVM were closely related to the presence of abscesses and cortical infarctions. Four patients had abscesses, four had cortical infarctions, one had a cortical infarct and a vascular malformation, and one had no obvious focal lesion on MRI. No patients had intracranial hemorrhage. The overall prevalence of clinical ischemic events and radiologic infarctions is also included in table 2. The prevalence of imaging lesions in patients with single and multiple PAVM is summarized in table 3 . OR of cortical and subcortical infarctions for patients with multiple PAVM were generally on a magnitude of at least two. The difference in prevalence of any infarction between patients with single and multiple PAVM was significant. No patients had large subcortical (striatocapsular) infarcts. The prevalence of clinical ischemic events is also listed in table 3. Of patients with complete records, ∼64% (29/45) of patients with multiple PAVM and 29% (6/21) of patients with a single PAVM had clinical or radiologic evidence of ischemic involvement (OR = 4.5, 95% CI 1.47 to 14, p = 0.008). Among patients with a single PAVM, FA diameters tended to be larger in those who did not have cortical infarctions. The mean FA diameter for patients with cerebral infarction was 4.2 mm and the median was 4.3 mm (range 3.5 to 4.9 mm). In patients without cerebral infarction, the mean FA diameter was 6.9 mm and the median was 6 mm (range 3 to 16.1 mm). As determined by Wilcoxon scores (rank sums), the distributions of FA diameters in infarct and noninfarct cases were not significantly different. Aneurysmal sac sizes were also larger in patients who did not have cortical infarctions. The range, median, and mean aneurysmal maximum diameters for infarct patients were 16.2 to 22, 21.6, and 19.9 mm. The corresponding dimensions for noninfarct patients were 9.5 to 90.5, 27.6, and 31.9 mm. The distribution of cerebrovascular risk factors is provided in table 4 . A similar frequency of risk factors was present in the single and multiple PAVM groups. When patients with vascular risk factors were excluded from the analysis, the prevalence of radiologic cortical infarctions became 11% (2/18) in patients with a single PAVM and 22% (8/36) in patients with multiple PAVM. If only patients with hypertension or diabetes were excluded, the prevalence of small deep subcortical infarctions was 27% (4/15) and 41% (13/32) in the single and multiple PAVM groups. Paradoxical cerebral embolization is one of the most difficult causes of stroke to study. Detection of the conduit for paradoxical embolism, whether PAVM or PFO, is usually the only indicator of the ischemic mechanism because the source of embolism is usually not found.19 The anatomic characteristics of PFO are often considered predictors of the risk for paradoxical embolization.12 The association between PAVM and cerebral ischemia has been well documented in the literature.9,11⇓ We used our extensive experience with HHT to study the characteristics of PAVM that may be associated with paradoxical cerebral embolization. Our study confirms prior reports of an association between cerebral infarction and the presence of PAVM.9,11⇓ We found cortical infarctions suggestive of an embolic mechanism in 14% of patients with single PAVM, the majority of whom had no vascular risk factors. When cortical and subcortical infarctions are considered, this number becomes 32%. In patients with a single PAVM, the prevalence of infarction did not appear to correlate with larger FA sizes when they exceeded 3 mm. Additionally, our empirical experience has not indicated any risk for cerebral infarction when FA diameter is <3 mm. However, the limited number of patients in our study did not allow stratification of prevalence by different diameter groups. We found no correlation between aneurysmal size and embolic infarction, but maximum diameter is only an approximate estimate of the total volume. There is currently no documented angiographic evidence of intra-aneurysmal thrombus. The multiplicity of PAVM increased the prevalence of cortical infarction from 14% in patients with single PAVM to 27% in those with multiple PAVM. When all types of cerebral infarctions are considered, the prevalence of infarction increased from 32% in patients with a single PAVM to 60% in those with multiple PAVM, making this a significant difference. Whereas in our series, 46% of patients with a single PAVM and 59% of patients with multiple PAVM had a history of cerebral ischemia or abscess, almost 70% of patients with diffuse PAVM had a history of ischemia or abscess, according to a recent publication.20 Diffuse PAVM are defined as AVM involving every subsegmental artery of at least one lobe and are more extensive than multiple PAVM. These findings suggest that the prevalence of paradoxical embolization may depend on the total surface area of all the venous–arterial channels that are patent for emboli to traverse. Cerebral abscesses have been presumably related to paradoxical embolization via PAVM. We found an 8% prevalence of abscess in patients with a single PAVM, consistent with prevalences reported in previous series.9 Similar to our findings for cerebral infarction, the prevalence of abscesses increased twofold in patients with multiple PAVM to 16%. A history of seizures directly paralleled the occurrence of abscesses and cortical infarctions and was probably a secondary phenomenon. There are some potential limitations to our study. Patients with PAVM and a normal thoracic CT or arterial PaO2 may have been excluded from our series. However, we have not seen cerebral ischemic events during long-term follow-up of our patients when PaO2 levels or thoracic CT scans are normal. Therefore, patients hospitalized for endovascular occlusion of PAVM constitute the major subset of those susceptible to paradoxical embolization. The unilateral angiogram in two patients with single PAVM may have failed to detect a PAVM on the noninjected side, but a normal CXR of the noninjected lung and a normal arterial gas study after occlusion make this error unlikely. As these patients did not have clinical or radiologic evidence of cerebral ischemia, an impact on the final results is very unlikely. Procedural bias regarding the variable frequency of CT and MRI obtained and the difference in resolution between the two scans was unavoidable in this study. However, each modality was used only to the degree that its resolution was considered adequate. Nevertheless, the true prevalence of CVM may have been underestimated, as 31% of patients did not have an MRI. The retrospective review of clinical data and adjudication of events carry innate limitations, but all attempts were made to obtain the most pertinent details from the most reliable sources. An assessment of the relation between polycythemia and cerebral ischemia was not possible, as hematocrit levels at the time of neurologic presentation were not always available. However, polycythemia may not be a reliable predictor of cerebral ischemia, given that hematocrit levels markedly fluctuate depending on the balance between the degree of hypoxia and the rate of hemorrhage at any one time. Supported in part by the Josephine Laurence Hopkins Foundation and March of Dimes (HHT-FY99-677) (R.I.W. and K.H.) and NIH/NCRR/GCRC (program grant RR00125) (T.Y.-Z.M.). Di Tullio M, Sacco R, Gopal A, Mohr J, Homma S. Patent foramen ovale as a risk factor for cryptogenic stroke. Ann Intern Med . 1992; 117: 461–465. Lechat P, Mas J, Lascault G, et al. Prevalence of patent foramen ovale in patients with stroke. N Engl J Med . 1988; 318: 1148–1152. Guttmacher A, Marchuk D, White RI. Hereditary hemorrhagic telangectasia. N Engl J Med . 1995; 333: 918–924. Shovlin C, Letarte M. Hereditary hemorrhagic telangectasia and pulmonary arteriovenous malformations: issues in clinical management and review of pathologic mechanisms. Thorax . 1999; 54: 714–729. Gossage J, Kanj G. Pulmonary arteriovenous malformations: a state of the art review. Am J Respir Crit Care Med . 1998; 158: 643–661. Fayad P.Neurologic manifestations of hereditary hemorrhagic telangectasia. In: Gilman S, Goldstein G, Waxman S, eds. Neurobase. 2nd ed. La Jolla, CA: Arbor, 1995. Adams H, Bosch E. Hereditary hemorrhagic telangectasia. In: Vinken PJ, Bruyn GW, eds. Handbook of clinical neurology. Amsterdam, the Netherlands: North Holland Publishing, 1979: 257–284. Roman G, Fisher M, Perl D, Poser C. Neurological manifestations of hereditary hemorrhagic telangectasia (Rendu–Osler–Weber disease): report of 2 cases and review of the literature. Ann Neurol . 1978; 4: 130–144. White RI, Lynch–Nyhan A, Terry P, et al. Pulmonary arteriovenous malformations: techniques and long-term outcome of embolotherapy. Radiology . 1988; 169: 663–669. Lee D, White RI, Egglin T, et al. Embolotherapy of large pulmonary arteriovenous malformations: long term results. Ann Thorac Surg . 1997; 64: 930–940. Swanson K, Prakash U, Stanson A. Pulmonary arteriovenous fistulas: Mayo Clinic experience 1982–1997. Mayo Clin Proc . 1999; 74: 671–680. Homma S, Di Tullio M, Sacco R, Mihalatos D, Giuseppe LM, Mohr J. Characteristics of patent foramen ovale associated with cryptogenic stroke: a biplane transesophageal echocardiographic study. Stroke . 1994; 25: 582–586. Shovlin C, Guttmacher A, Buscarini E, et al. Diagnostic criteria for hereditary hemorrhagic telangectasia (Rendu–Osler–Weber syndrome). Am J Med Genet . 2000; 91: 65–66. Hewes R, Auster M, White RI. Cerebral embolism—first manifestation of pulmonary arteriovenous malformation in patients with hereditary hemorrhagic telangectasia. Cardiovasc Intervent Radiol . 1985; 8: 151–155. White R, Pollak J. Pulmonary arteriovenous malformations: diagnosis with three dimensional helical CT—a breakthrough without contrast media. Radiology . 1994; 191: 613–614. White R, Pollak J, Wirth J. Pulmonary arteriovenous malformations: diagnosis and transcatheter embolotherapy. J Vasc Interv Radiol . 1996; 7: 787–804. Bamford J, Warlow C. Evolution and testing of the lacunar hypothesis. Stroke . 1988; 19: 1074–1082. Hommel M, Besson G, Le Bas JF, et al. Prospective study of lacunar infarction using magnetic resonance imaging. Stroke . 1990; 21: 546–554. Lethen H, Flachskampf F, Schneider R, et al. Frequency of deep venous thrombosis in patients with patent foramen ovale and ischemic stroke or transient ischemic attack. Am J Cardiol . 1997; 80: 1066–1069. Faughnan M, Lui Y, Wirth J, et al. Diffuse pulmonary arteriovenous malformations: characteristics and prognosis. Chest . 2000; 117: 31–38. Millikan C, Futrell N. The fallacy of the lacune hypothesis. Stroke . 1990; 21: 1251–1257.